Leaked images of LG’s prototype X3 smart phone have surfaced, showing that the company plans to enter the Quad-Core and NFC markets soon, according to Gadget Help. The X3 is expected to sport a Nvidia Tegra 3 Quad-Core processor, 4.7-inch 720p HD screen, 16GB of internal storage with Micro SD slot, as well as Wi-Fi, Bluetooth and NFC connectivity. 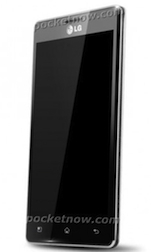 The handset will also run on Android 4.0 “Ice Cream Sandwich” operating system, meaning it will come ready to connect to other NFC phones with the Android Beam peer-to-peer content sharing app. The device also manages to fit a best-in class 2000mAh battery in a slim 9mm frame, as seen in the leaked photo above, courtesy of Pocket-Now. Keeping in mind that these specs are all speculative, Gadget Help expects to see a slightly different X3 handset from LG debut at the Mobile World Congress event next month.